Some kids make snowballs and have fabulous snowball fights. My kids make snowballs and eat them. Eating snow is probably their favorite winter activity. 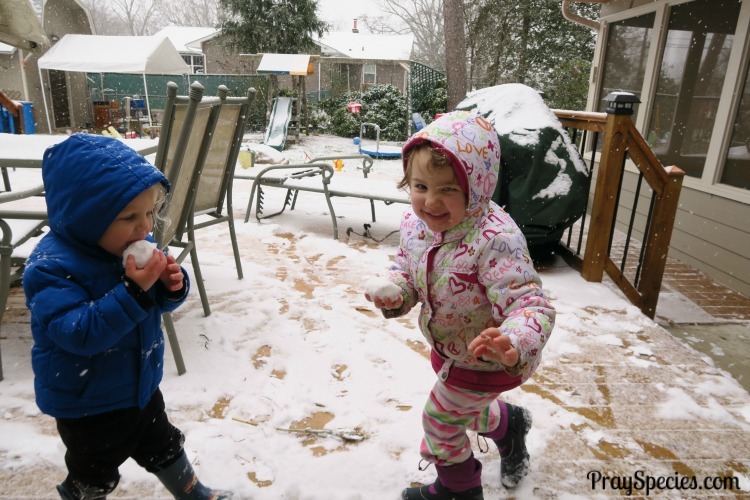 They will eat it face first off the deck, off their gloves, off the slide, off pretty much anything……..
I’m not thrilled they eat snow. I accept it. I have strong willed children and need to pick my battles. This isn’t typically one of them. This week during our first snow storm of the year, I had them conduct an extension of a simple experiment in an effort to show them the “nasty” that can be in snow. Each time it snows, I have the kids conduct the simplest science experiment in the world. I have them collect snow, bring it inside and watch to see what happens. The activity was originally inspired by BFIAR’s activities for “A Snowy Day,” by Jack Keats. In the story, the main character takes snow and saves it in his pocket. The snow magically disappears when he comes inside, i.e. melts in the warmth of the house. The first time we did the activity, I had Ladybug put a snowball in the pocket of her coat and hang it on the door. First it took forever to melt and then when it did, the jacket material absorbed all the water. I had successfully managed to convince my daughter that snow actually disappeared. Not exactly the plan. So, now, rather than hide the snow in a pocket, we place our snow inside a dish. In recent years, I’ve started having them place it in front of the fireplace so the melting happens faster and can keep their interest. First I had them gather snow and leave it to melt as they had done in previous years. Then, I had them look at the melted snow/water and identify some of the other objects they saw in the bowl, such as pine needles, dirt, etc. I reminded them that this snow was the snow they were eating outside in the backyard. I then had them gather the “cleanest” snow they could find and put it out in a bowl to melt. There were a few small pieces of yard material, but overall the melted water was much cleaner than the first trial. We took the “clean” melted snow/water and ran it through a coffee filter to see the debris that was too small for them to be able to see. There was a ton! I had hoped this would help stop, OK slow the massive amount of snow eating each time they head outside, but I have yet to see that benefit. They do now; however, have a fabulous understanding that snow melts, pine needles don’t, and eating snow should possibly be done when Mom turns her back. I had high hopes that showing the kids that debris and dirt they couldn’t see with the naked eye existed in the snow would also help them understand that germs are real. Germs are tough, since they are so small, it’s hard for many kids to believe they are real and that washing your hands is a really a good idea and not just some crazy rule Mom came up with to make them nuts. Alas, no such luck. I think my daughter will only believe me that not washing her hands can cause her to get sick if she actually becomes ill with pneumonia immediately upon refusing to use soap. Since instantaneous pneumonia upon not watching her hands is unlikely, I’ll just have to keep talking and she will likely keep testing the truth of my words. If you have struggled with explaining germs to little ones – I have read a ton of books about germs to them and so far, only two have made an impact. This gem actually helped them understand that germs are small, but real. For whatever reason, my kids actually responded to this story and started singing Happy Birthday (sometimes even twice as suggested) when washing their hands. Oh, and this one, “Let Them Eat Dirt: Saving Your Child from an Oversanitized World” is for you – just read the title, it’ll help you feel like letting them eat snow and dirt is actually good parenting; a sentiment I’m more than happy to believe and spread. If you are a Mom or Dad or Grandparent in the trenches with a kid who eats snow and likes to skip the soap when washing their hands, I’m thinking of you and rooting for you. Thank God kids are resilient.